Perfect for home-made jams. 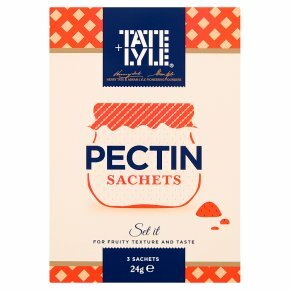 Suitable for vegetarians and vegans.Tate & Lyle Pectin is a perfect for home-made jams and jellies made with soft fruits. By mixing one sachet of Pectin with 1 kg of Tate & Lyle Fairtrade Granulated sugar and some Fairtrade Lemon juice, you can make life a little sweeter with soft fruit jellies and jams.